Teachers create a class account. Students login – no email required. Content is age-appropriate, user-friendly, and ad-free. The website is easy to navigate and the variety of material keeps students engaged for hours (really — I’m serious). Cover one unit per week as a class, which will take about forty-five minutes. Share the Digital Passport leaderboard to show student progress on the class screen. When students finish, they can move on to the next activity. Cover one unit per meeting of the student’s choice. Share the leaderboard on the class screen so it’s clear to students which units they have completed and which they have yet to do. Replace regular homework with these units. Students will love gamifying their homework. All results are stored in the Digital Passport cloud so updates the leaderboard from wherever students play. Have students read digital books and write reviews that can be added to the school library website. From there, they are attached to the book so future readers can see classmates’ thoughts on a book they are considering, in words they understand. If you ever read Amazon reviews, you understand how powerful these reviews can be when making a selection. Give students one day a week (or more, or less, but a set amount of time) to read their book. When they are ready to write the review, provide a book review guideline that asks them to include book essentials (such as title, age group, author, and copyright), a three-sentence summary, and a recommendation. It may include a picture that the reviewer feels sums up the book and would excite potential readers. The review should be able to be read in about a minute and not include the book’s ending. This update to the traditional book report isn’t just about reading. It’s about writing, communicating, sharing, perspective-taking, and collaboration. Devote the last month or two of school to student-driven reviews of age-appropriate books. Use the same template for all reviews so that review readers get used to what to expect from the reviews and where to find what material. Push this out to a summer activity where students review the books they read over the summer. Because this is digital, it can be emailed or uploaded to a location in the cloud such as Google Classroom or OneDrive. Start by adding these reviews to your class library and then, with the evidence of their popularity, suggest them for the school library. Many schools no longer teaching keyboarding, adopting the attitude that students will learn what they need to know when they need it. If you have students who still hunt-and-peck, who fall behind on homework because they’re searching for the F key (or any of the other 25 letter keys), or try to “thumb” the keyboard as they do a mobile device, you know this often doesn’t work (see this article from the Washington Post on keyboarding in the classroom). Many students need help to learn the right way to keyboard and how to type with speed and accuracy. Teaching a three-week course in keyboarding at the end of the school year, where class time is used to teach typing skill s while completing an authentic project, will excite students who thought they had to slog through another unit in American History or Calculus. For students who are comfortable with typing but slow: Try competitive keyboarding programs like NitroType or Typing Tournament. These are game-based learning where students strive to type fast so they can beat an opponent. The opponent might be a classmate or an anonymous person on the Internet, depending upon the program you select. For students who are learning the skills: Try programs that teach row-by-row in a fun way. This could be Dance Mat Typing for youngers or Type to Learn for olders. For any level of student: Offer a variety of game-based typing practice and let students pick the one that works best for them. Here’s a long list of options. Whichever works for you, spend only 15 minutes per class on the program and then move on to academic content. Students will look forward to this warm-up and may even use it at home. Dedicate 15 minutes a class to typing practice with any of the options mentioned. This provides fundamentals that can be used to complete class projects and homework faster and more effectively. Have students type a school project (such as a book report or essay) while paying attention to keyboarding skills. This blends typing skills with real-world examples of why they learn to keyboard. Cyberbullying is a critical topic that most schools try to cover with a one-and-done sort of approach. That isn’t the best way to do it. In fact, anecdotal evidence shows that cyberbullying, like play yard bullying, is a topic best taught by returning to it over and over throughout the school year. Many students think they don’t cyberbully until they find out what that word means. Many more think the insults they share online don’t hurt because they aren’t face-to-face. The end of school is your chance to scaffold what students know in time for summer — when many will spend (way too much) time on the Internet, talking to friends and strangers. Start with videos that educate students about cyberbullying. If you Google “cyberbully movies“, you will get a long list or find some here to get started. Preview all materials before giving students access. Some are heart-breaking and might emotionally be more than your students can take on. Others are intended for older students. When you’ve narrowed your list down, devote at least a class period to watching the videos and a class period to debriefing students on what they watched. That last could be the most important part, giving students a chance to share their thoughts and organize their thinking as they move forward and integrate it into their knowledge base of interpersonal communications. Let students pick their own video(s). Give them the list and let them click around as they find one or more best-suited to their thinking or needs. Pick one and view it as a class. This is a good choice when you know what your student group needs or are starting with the basics. Take as much time as you have available — anywhere from a short video to a full-length movie to show how cyberbullying starts, what the victim feels, and the damage that can occur from this “innocent” joshing. This is a free technology curriculum for Middle/High School and adults from Google. It has eighteen units that blend tech knowledge into the real world. Topics include If-Then Adventure Stories; Research and Develop a Topic; Technology, Ethics, and Security; Plan an Event; Technology’s Role in Current Events; Plan and Budget; and eleven more. You can sign in as a teacher or student. As a teacher, you have the ability to add classes, manage workflow, and collect data on student progress. Learning technology is one of those topics that many schools — especially middle and high school — teach as an elective. That means lots of students don’t ‘elect’ it and then don’t learn the basics required to use technology for classwork and life. Often, schools wrap it around a topic such as Coding or Image Editing. What often is skipped is the basics, under the misguided assumption that students already know this. Google’s Applied Digital Skills ensures that all students get those basics in an entertaining and inclusive way. Assign select units that you feel students lack (such as Plan and Budget or Technology, Ethics, and Security). Let students pick the skills they would like to learn. Pick skills that pre-load for next year’s schoolwork. Pick skills that apply to outside-of-school activities like Digital Tools for Everyday Tasks. For seniors, pick skills that apply best to the work world or college such as Use Google to Get a New Job. Pick a unit like Manage a Project with Digital Tools or Plan an Event that encourages students to collaborate with school end-of-year activities such as Open House or a Spring Concert by making fliers to promote the activity. 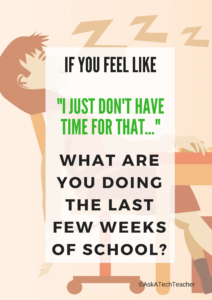 The end of a school year is a rare time when the pressure to complete classwork slams into the brick wall of brain fatigue. No matter how much you wish students would stay on task, they are as eager for summer as you are. Use that need-for-change to engage learning that isn’t part of the granular curriculum but no less important. I’d love to hear how you spice up your end-of-year activities to better-engage students.